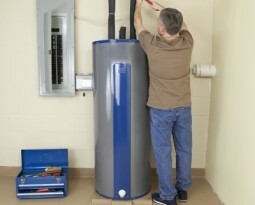 Most modern hot water heaters require very little maintenance. They last anywhere from ten to fifteen years, and they seldom have an issue. However, as the hot water heater nears the end of its life and its parts begin to fail, you may end up with an emergency that requires immediate attention. Unless you have intimate knowledge of hot water heaters and how they interact with your building’s utility lines, you should definitely call a professional who has the training and experience to handle any such emergency. Knight’s Plumbing has the knowledge and experience to address any hot water heater issue. After addressing any emergencies, we will give your hot water heater a proper inspection. We will show you the problem clearly, so that you understand the exact reason for the service. After quoting you a flat rate, we will get right to work. We have 24-hour emergency service, and we are available any day of the week. Sometimes hot water heaters collect sediment and need to be flushed out. Other times, a valve or a sensor needs to be replaced. Sometimes the thermostat on a hot water heater is set too high. In some cases, such minor issues can lead to a mechanical failure. Many times, once these issues are addressed, the hot water heater can go right on working for another several years. 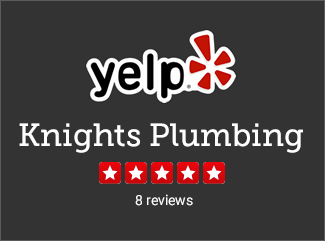 The experts at Knight’s Plumbing have saved many people time and money in unnecessary repairs. If your hot water heater simply needs a replacement part, Knight’s Plumbing will understand exactly how to get it. 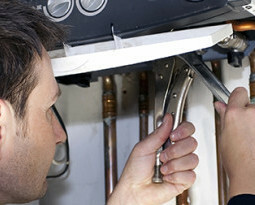 We have serviced and replaced every brand of hot water heater you may have. We’ve installed Rheem, Rudd, Lenmore, General Electric, Bradford, A.O. Smith, and all others. Although there are many ways to help your hot water heater last longer, nothing lasts forever. When it comes time to replace the unit, you should ask several questions: Is your hot water gas or electric? Do I want to switch to gas or electric? What gallon capacity and recovery rate is appropriate for the changing needs of my family or business? What size unit would be appropriate for my space requirements? What is the energy efficiency of my current unit, and how can I improve on it with a newer model? If your faulty hot water heater is creating an emergency, and have water all over your floor, you may not be thinking about the answers to these important questions. When you contact Knight’s Plumbing under such circumstances, we will not lose sight of the big picture. We will mitigate the emergency, and perform our inspection. And once it is clear that you want to replace your hot water heater, we will sit down with you to ask these important questions. If your intention is to switch from gas to electric, or from electric to gas, then you will definitely want a professional team with experience handling your gas lines. Gas lines are dangerous, and if you trust them to the wrong team, you may be playing with fire. The professionals at Knight’s Plumbing install gas lines on a regular basis, and will know exactly how to protect your home when installing or replacing a gas hot water heater. You also will want to select a hot water heater with an appropriate size. In the case of a large family, a 50-gallon unit is not uncommon. Hot water heaters are big and heavy. Knight’s Plumbing has the manpower needed to deliver your new heater, and extract the old one. Once we remove the old heater, we will recycle it for you. 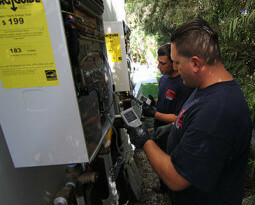 As hot water heaters become more energy efficient, many people choose to upgrade. The professionals at Knight’s Plumbing take time to research the latest models to understand how best to serve their clients’ needs. We can be a resource to you. Although many people are willing to overspend on a new unit in order to save money on their energy bill, you don’t always get what you pay for. Knight’s Plumbing can educate you on the various features of the different units you are considering, and give you a number of options. We won’t make up your mind for you, but we can empower you to make a choice that you can feel great about. These days, many people are choosing to switch to a “tankless” hot water heater. Such units, by not having a tank, heat water as it is being used, so that there is a continuous supply. Such units are smaller and more energy efficient that their predecessors, and they also save water. In some cases, by switching to a tankless system, a home or business owner can even apply for a tax credit. The Experts at Knight’s Plumbing can give you a consultation to determine whether a tankless hot water heater is right for your home or business. We have intimate knowledge of all the available systems, and can present to you a reasonable set of expectations for the unit you are considering. We will break down the installation process for you, and quote you a flat rate that you can be comfortable with. And once we install the unit, we are still your choice for servicing it. You can expect the same expertise on a tankless system that we give to any standard hot water heater. Regardless of how urgently your hot water heater needs attention, you can still count on the experts at Knight’s Plumbing. We are available 24 hours a day, seven days a week. We are conveniently located in the center of Orange County, and can be at your home at a moment’s notice. We are punctual, well-groomed, and respectful of your home or office. But most importantly, we respect you. We want your future business, and the best way to ensure that is to earn your respect.